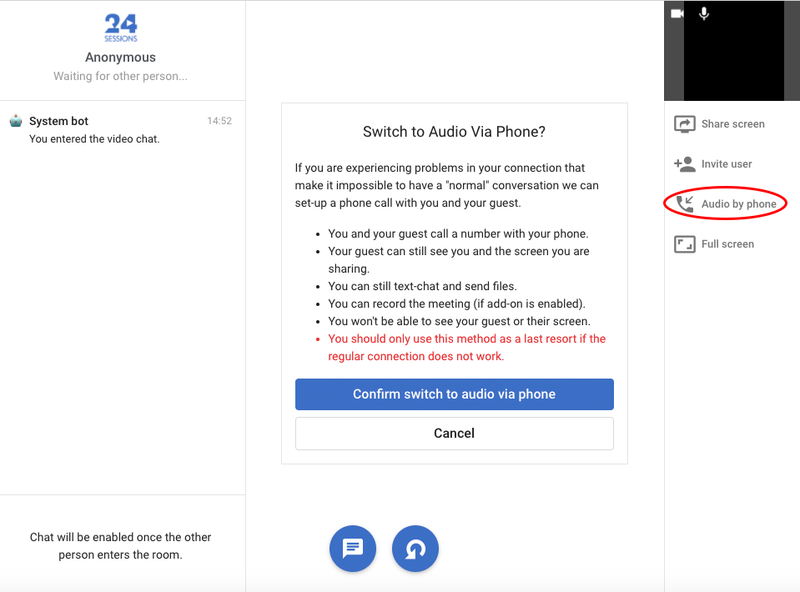 Establishing a solid connection remains the number one concern for people considering video chat meetings. With our Audio by Phone solution, however, you can always stay connected. Your customer can still see you on his/her screen via 24sessions (even though he/she might not be visible for you). You can still share your screen with your customer. You and your customer are still able to use the chat function and exchange documents. How can I use streaming? During a video chat: you can switch to streaming by clicking the ‘Audio by phone’ button and following the instructions shown on screen. Before a video connection: whenever you are not able to establish a video connection for whatever reason, there is an automatic fall-back that allows you to still continue and connect via streaming. 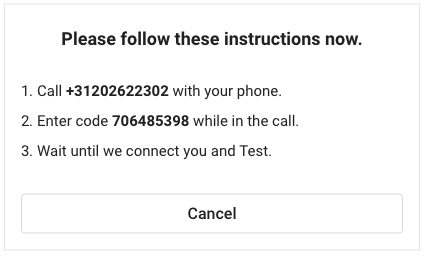 Both you and your customer will be instructed to call a phone number (+31 20 2622303) and to enter a code (both will be provided on your screen). No worries, streaming your video chat over phone is free, so no costs for calling will be billed. Hereafter, you will be connected with your client. The customer can still see you (and your shared screen) on your laptop, and audio will be provided via phone. When finishing your call, you can simply click end conversation on both your phone and laptop. Please feel free to contact one of our Customer Success Managers if you have any questions left! Tip: if you have any questions left, please feel free to contact us via the online chatbox in the bottom right.